The story behind the name: Tucana is named for the Toucan, a brightly colored South American bird with a very large, thick bill. The shape of the constellation looks like the bird's bill. 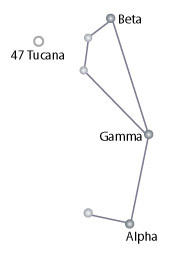 Tucana is another collaboration between the Dutch navigators Keyser and de Houtman who charted the southern skies on a voyage to the East Indies, and Johann Bayer, an astronomer who cataloged and published their newly discovered star patterns in his 1603 sky atlas. They named several other southern constellations for birds. Other astronomers, such as Johannes Kepler, who formulated the three laws of planetary motion, and Giovanni B. Riccioli, who was the first to observe a double star, called it Anser Americanus, the American Goose. Tucana is its official name.